Cypriots streamed into banks on Thursday morning for the first time in two weeks, to find out whether their deposits had been reduced and to transact long overdue business. Many came away with their business incomplete and their questions unanswered. But strict controls on movement of capital put in place by the finance ministry on Thursday mean that Angelos cannot remit overseas any amount above 5000 euros without special permission from the Cypriot central bank. All he was able to do was to leave money orders with Laiki Bank. and hope for an answer the following day. Neoklis, 31 and his brother Konstantinos, 37, have an even more serious problem. They have 350,000 euros in deposits with the troubled bank, 250,000 of which is not covered by a Europe-wide banker’s guarantee. That makes it liable to a levy that all uninsured deposits will be subject to at Laiki and the Bank of Cyprus, the country’s two biggest lenders. The situation was far from normal. The government had been in talks with its Eurozone partners since last year for a bailout loan for both the indebted government and the banking system. On March 16, the Eurozone told Cyprus that while it would extend the government a 10 billion euro loan to help shore up publicly guaranteed pension funds and balance its budget, the banks would have to rescue themselves. Lacking any ability to borrow, the banks’ only choice was to pick their customers’ pockets or go bust. How much they will pick from accounts above 100,000 euros remains to be announced. “We’ve lost our trust in the Cypriot banking system, we’ve lost our faith in our politicians,” says Konstantinos. “We will figure out how to manage our wealth in the best possible way for our children,” rejoins Neoklis, adding that moving some money overseas is not out of the question. They do have one hope of avoiding a levy. Bankers have told Al Jazeera that they will only penalise depositors once all their liabilities have been offset against their assets. The brothers have taken out a 300,000 euro loan that puts their net worth below the levy threshold. “We came to find out whether our deposits and our loans will cancel each other out,” said Konstantinos. The bank couldn’t tell them, perhaps because it hasn’t finished crunching the numbers for more than 300,000 clients. “No one could tell us when we’ll know,” Konstantinos said. Cyprus is reeling from the experience of the last two weeks. This island nation has become prosperous as an offshore business centre, offering corporate legal, consultancy and banking services. That has given local businesses a boon of easy credit and a low corporate tax of 10 percent. Capital controls, the eurozone’s first, and in theory a temporary regime, come as an enormous shock. Overnight, Cyprus has forbidden money transfers abroad except to pay for imports or student tuition. Cypriot credit cards will have a limit of just under 5000 euros overseas, and outbound travellers have been told to take no more than 1000 euros in cash. Individuals and companies based in Cyprus will be obliged to repatriate their earnings from overseas activities within two weeks of transactions. The government views these controls as temporary but necessary to prevent a massive capital flight, which could cripple the banking industry anew. Even Finance Minister Mihalis Sarris, who has been a staunch defender of the compromise reached with the Eurozone, has let his frustration slip. “We could have borrowed 12 billion, but for various reasons our partners wanted to restrict our borrowing,” he said at a press conference on Tuesday. By then, however, the outlook for the Cypriot economy is grim. The Institute of International Finance, which represents banks and financial institutions, on Wednesday released a report expecting Cyprus to lose much of its services economy: "While it is hard at the current time to be confident about the degree of likely declines in GDP, it seems plausible that the cumulative decline could amount to as much as 20% of GDP in 2013-15." A preliminary study by Belgian bank Societe Generale came to a similar conclusion. Cypriot frustration is now being expressed in the form of a judicial panel, announced by President Nikos Anastasiades on March 25, to investigate culpability among bankers, politicians or anyone else. There are no guarantees as to whom it might implicate. Cypriot banks prepare to open tomorrow for the first time in 13 days, even as the process of refinancing them is still underway. Authorities are trying to avoid a massive capital flight from depositors. The finance minister has decreed a severe set of capital controls which are to remain in force for four days. Cyprus will forbid money transfers abroad except to pay for imports or student tuition. Cypriot credit cards will have a limit of just under 5000 euros abroad, and outbound travellers will only be able to carry 3000 euros or other currency equivalent. Individuals and companies based in Cyprus will be obliged to repatriate their earnings from overseas activities within two weeks of transactions. 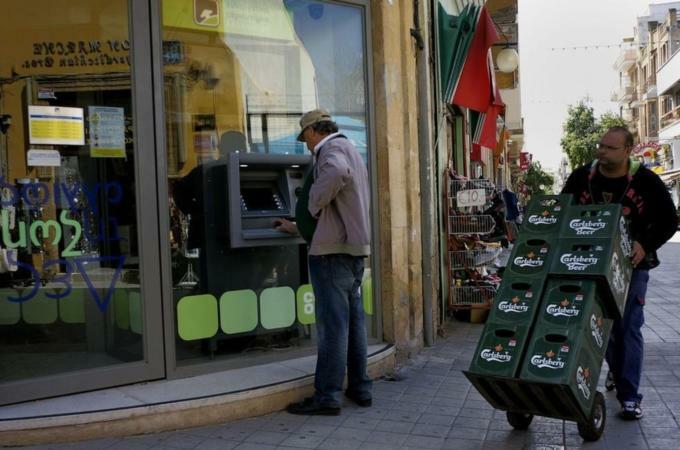 The tough decree, if confirmed as the final one, aims to keep as well as replenish deposits in Cyprus, amid fears of an impending capital flight. Banking and corporate legal services are the island’s major industries. But a deep recession is still feared likely. The Institute of International Finance which represents banks worldwide believes the island could lose a fifth of its economy by over the next two years. These proposals may have been influenced by the Institute of International Finance, which represents banks and financial institutions, and which today released a report expecting capital flight to be high. Cypriot central banker Panikos Dimitriades last week said he estimated it at seven billion euros. Whatever the flight, though, Cyprus is expected to lose much of its services economy. The IIF says that "while it is hard at the current time to be confident about the degree of likely declines in GDP, it seems plausible that the cumulative decline could amount to as much as 20% of GDP in 2013-15." The two biggest Cypriot banks, the Bank of Cyprus and Laiki Bank, have been in crisis since Eurozone finance ministers on March 16 refused to refinance them with a loan. The Eurozone only agreed to lend ten billion euros to the sovereign, which may be used to balance the budget and shore up pension funds, but not to refinance banks. The banks’ only choice now is to take a chunk of depositors’ money and turn it into shares. The two banks are insolvent because they invested heavily in Greek bonds, whose value collapsed. The IIF had choice words for Cypriot negotiators. “In the last few days Cyprus came closest of any country to date to leaving the Euro in a disorderly fashion,” it says. “After a week of messy negotiation and flawed proposals, default and devaluation was avoided only though the imposition of what may well turn out to be very large losses on bank creditors.” Those losses will take the form of a one-off levy on deposits above the insured sum of 100,000 euros. Cyprus will wind up Laiki Bank, the country’s second-largest, and transfer its insured deposits of 100,000 euros or less to the Bank of Cyprus, the Eurogroup agreed with Cypriot president Nikos Anastasiades on Monday morning. That would in theory render the Bank of Cyprus viable, while deposits of more than 100,000 euros at Laiki would be used to cover the costs of covering the bank’s liabilities and winding it up. Estimates of how much of their money large depositors will lose range between 20-30 percent. Anastasiades addressed the nation on Monday night to explain that , though painful, the deal was the best possible under the circumstances. The sacrifice of Laiki was thought necessary after the government of Cyprus failed to find funds to bail out the country’s two biggest banks last week, and the European Central Bank announced that it would cut off liquidity to them after today. The banks would have defaulted on their obligations within hours of opening. The government had proposed funding the bank bailout through a one-off levy of 6.75 percent of deposits under 100,000 euros and 9.9 percent of deposits above that figure. But that plan, agreed to by the Eurogroup after an all night session on March 16, was scuppered by the Cypriot parliament three days later. Lawmakers pointed out that there was no guarantee that similar levies would not follow, or spread to other European banking systems. The leading opposition party, the communist AKEL, in particular, said that Cyprus would emerge with a plan of its own that would centre on selling bonds on future revenues from recently discovered offshore gas and oil fields. AKEL president, Andros Kyprianou, also said he would help Anastasiades find money through overseas loans. Russian businesses hold some 18-20bn euros in offshore accounts in Cyprus, and it was thought that Vladimir Putin might step in with public money to protect private Russian investments. In the euphoria of the moment, even Greek coalition leaders expressed support for the no vote in Nicosia, despite the fact that they have staked their political careers on accepting a harsh bailout from Brussels. Perhaps they felt that Cyprus would now avoid the fate of Greece. Cypriot Finance Minister Michalis Sarris was despatched on Tuesday to Moscow to negotiate a loan. By Friday, Russia declared that the only concession it was willing to make was to renegotiate the terms of its existing 2.5bn euro loan to Cyprus. By then, European leaders were also expressing skepticism over whether Cypriot energy resources could be evaluated accurately enough in time for a bond issue. Thus, Cyprus’ two most speculative funding options were closed. To formulate a plan B, Anastasiades was forced to return to the basic tenet of plan A – taking money from Cypriot and overseas account holders. The crucial refinement of plan B is that ordinary Cypriots with accounts of 100,000 euros or less won’t be affected. The Cypriot business community now worries about two dangers. The immediate one is that much of the estimated 68 billion euros in Cypriot banks may fly the country. The longer-term danger is that Cyprus may lose much of its economy, an estimated 80 percent of which depends upon business services. Nine bills voted into law over the past weekend aim to curtail both those dangers. One of the nine gives the central banker and finance minister extraordinary powers to impose temporary capital controls, so that when banks do reopen the flight of money is limited. Those powers include limits to cash withdrawals or the use of credit cards, debit cards and cheques. They allow the freezing of accounts, prevent the opening of new accounts, and halt transfers and transactions within a bank or between banks. 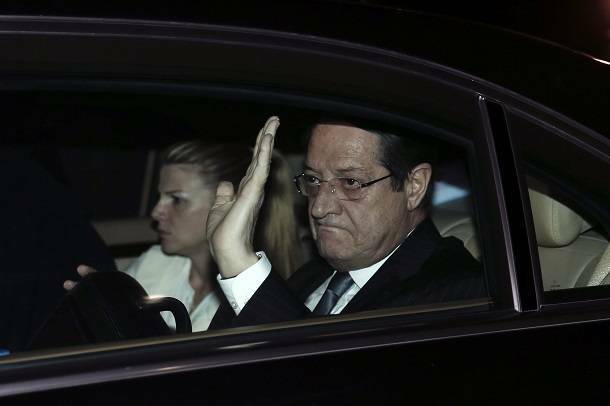 Anastasiades said they would be imposed for the shortest period possible. Another key piece of legislation laid down the powers that will now allow the central banker to resolve Laiki Bank. The Law on the Resolution of Financial Institutions gives the Cypriot central banker sweeping discretionary powers to resolve any financial institution on evidence of unviability or lack of solvency or mismanagement. It is based on an ECB directive other eurozone members have harmonised and which, bankers say, has been under preparation in draft form long before the February election. It also hands the central bank complete discretionary power to transfer or sell an institution's assets, manage the institution and be legal guardian of it for up to five years. The central bank's two basic priorities are a) to ensure that the public interest is served and b) the institution is worth more through the restructuring than through outright breakup and sale. In other words, the institution's business activities should preferably be preserved. A third law passed last Friday will allow the president to create a so-called Solidarity Fund to help keep the island afloat, as it were. The fund was expected to raise billions by issuing bonds on the deposits of public pension and health maintenance funds; public real estate holdings; the property of the church, donated by Archbishop Chrysostomos; and those oil and gas deposits. While many of these assets have now been questioned as a sound basis for a bond issue, the fund may yet become a reality - though it is no longer expected to raise the 5.8 billion euros the Eurogroup originally required for Cyprus to qualify for an additional 10 billion euros in low-interest bailout money. The crisis of the past week has left Cyprus reeling, and furious. Not only bankers, but the business community too fear a collapse of the economy. The statement earlier on Monday by French Finance Minister Michel Barnier, that “Cyprus’ economic model is finished”, strikes to the heart of their concerns. Sarris’ extension of the closure of all Cypriot banks until Thursday underlines those concerns. Cyprus is still not ready to face the first day of the rest of its economic life. Until it does, and until the full effect of the eurozone’s medicine becomes apparent, the wisdom of the prescription remains in doubt. The Law on the Resolution of Financial Institutions was not composed over the past week. It is based on an ECB directive other eurozone members have harmonised and which, bankers tell us, has been under preparation in draft form long before the February election. It gives the Cypriot central banker sweeping discretionary powers to resolve any financial institution on evidence of unviability or lack of solvency or mismanagement. This suggests that authorities may believe the central bank might have to resolve a number of institutions, not just the two largest banks. It also hands the central bank complete discretionary power to transfer or sell an institution's assets, manage the institution and be legal guardian of it for up to five years. A statement released by Andros Kyprianou, the head of the communist Akel party, on Friday, to the effect that the government has not accepted or honoured its contributions and that the party is prepared to help but washes its hands of the outcome - suggests that it is preparing for a confrontation in parliament. It also ominously adds that it has eyes and ears behind the scenes - a warning to the ruling party that it is prepared to defend its corner stoutly with hitherto undeclared hostility if the government calls it on its contrariness. The central bank can set up an intermediary bank (which is considered the good bank), transfer assets to it and ask it to maintain the activities of the bank. In the case of Laiki, one lawmaker tells us, the good bank will receive all deposits up to 100K plus performing loans. The central bank may operate this for an initial period of three years, extendable to five. It must then sell it or liquidate it. Nonperforming loans and all deposits above 100K - apparently amounting to five billion euros - would remain in the rump Laiki, or bad bank. This would be liquidated. The central bank has the right to transfer any assets into and out of this 'bad' bank if the public interest is served. This essentially means that the central bank can sell what it wants in order to cover the liabilities and costs of liquidation to the state. The central bank can appoint an auditor to assess the value of assets in the good and bad banks, but has ultimate control over the outcome of those evaluations. In other words, it can act as liquidator and auction off assets on its own terms. The central bank essentially enjoys immunity from prosecution in the discharge of these duties, unless a plaintiff can prove breach of good faith. Officials at Popular Bank, the weakest of Cyprus' three largest banks, tell The New Athenian that an announced 'resolution' of the bank is likely to mean closure. "By 'resolution' I don't understand 'restructuring' or division into a good and a bad bank," said one official on condition of anonymity. "Our information is that all unguaranteed assets of over 100,000 euros will simply be taken to cover nonperforming loans and other liabilities. Essentially, it will destroy the bank." A former senior official at the bank concurred. "I don't know what resolution means, I haven't heard the details, but I think we shall end up not saving the bank but closing it," he said. The officials spoke amid a furore of speculation sparked on Thursday evening by Panikos Dimitriadis, the central banker of Cyprus, who announced that the bank would be 'resolved'. Popular Bank, or Laiki, was the worst affected by a restructuring of Greek bonds in March 2012, writing down three billion euros. It has been dependent on emergency cash from the European Central Bank ever since, borrowing up to nine billion euros according to bankers. But earlier on Thursday the ECB said it would cut emergency liquidity to the bank after Monday, because the bank is insolvent. That statement has widely been interpreted as designed to put political pressure on the Cypriot government to submit to the terms of a bailout it agreed to on March 16, but failed to pass in parliament three days later. According to the terms, Cyprus must generate 5.8 billion euros from its own public or private assets in order to receive a 10 billion euro loan from the eurozone. The government originally proposed to raise this through a one-off levy of up to 9.9 percent on all bank deposits. The measure caused an outcry and was defeated in the 59 seat parliament by 36 voters against, none in favour and 19 abstentions from the ruling party. That led to talk of a 'Plan B' for raising the money. Lawmakers tell The New Athenian that that will consist of a Solidarity Fund consisting of public assets, but inviting private investors to contribute. A possible levy is not ruled out, they say. "A few days ago we were celebrating avoiding a haircut," the Marfin official said. "But this is much worse. It is one thing to lose 5 - 10 percent of your deposits. It is quite another to lose everything." Hundreds of the bank's 3,000 employees gathered around parliament after Dimitriadis' announcement and chanted "hands off Popular Bank". Cypriot lawmakers tell EnetEnglish and The New Athenian that a key parliamentary bill being debated tonight will solely concern the formation of a Solidarity Fund, which will be comprised of the pension and health maintenance funds of the civil service and semi-state sector such as telecoms and port authorities. Public real estate might also form a part of these initial assets, the lawmakers said. The fund's value in this instance is estimated at about three billion euros, only half the value of the 5.8 billion euros Cyprus has to raise on its own in order to receive a 10 billion euro bailout loan from the European Union. It is therefore only the first part of what has come to be called 'Plan B' for Cyprus to avoid bankruptcy. Plan A was a one-time levy of up to 9.9 percent on bank deposits. Parliament rejected that after an outcry from Cypriot and foreign depositors. The solidarity fund would be open to private donations from Cypriots and from around the world, the lawmakers said. Those could eventually include the Church of Cyprus' offer to mortgage all its property holdings, but it could take time for their value to be assessed. It was also not clear how the government would use the asset pile, but the strongest scenario lawmakers said was for bonds to be issued on the strength of its assets. Cyprus' finance minister, Mihalis Sarris, who has been in Moscow since Tuesday, earlier told local media that he had offered the country's two insolvent banks, Marfin Popular Bank and the Bank of Cyprus, for possible sale to Russian interests. However, he said that in their current shape "they are not very attractive targets." The two banks are currently dependent on cashflows from the European Central Bank, which has said that it will cut them off after Monday unless "an EU/IMF programme is in place that would ensure the solvency of the concerned banks." Such a cutoff could trigger a collapse of Cyprus' entire financial system. Parliament is also expected to discuss a separate bill on how to restrict cash withdrawals and money transfers when banks re-open next week, to avoid a sudden capital flight, CNA, the state news agency said. Some media outlets spoke of as many as nine bills. Should the banks fail to find a buyer, they could be included in the Solidarity Fund. However, that would almost certainly make it necessary for the government to bring back the levy on deposits in some form. While Cypriot banks are cash rich, holding some 63 billion euros in deposits, they have been fatally weakened by a restructuring of Greek debt in March 2012, to which they were overexposed. Marfin Popular Bank wrote down some three billion euros, while the Bank of Cyprus lost some two billion euros. They have been dependent on ECB emergency liquidity assistance ever since. Their depositors' money is the banks' biggest asset. Another wildcard is a recently discovered oil and gas field southeast of the island. Its inclusion in the Solidarity Fund is not ruled out, but its value is difficult to assess precisely without further surveys.